This spring we welcomed a few special guests to Orca Island Cabins — photographer Chris Burkard and the prAna crew. As part of their “Stories” series, prAna wanted to explore ‘true wilderness,’ which brought them out to Orca Island Cabins! 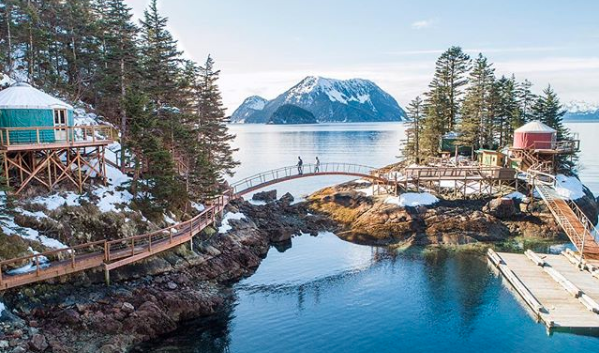 The crew explored the island and the yurts, taking advantage of all the beauty and adventure that Humpy Cove and Resurrection Bay has to offer. You can hear Dennis explain what makes Seward and Orca Island Cabins so unique in prAna’s video of their trip. The crew was able to surf the Alaskan waters and explore some of the wonders that Seward has to offer during their stay. Chris Burkard, the photographer on the trip, is known for his surf and landscape photography. He travels the world finding unique, untamed landscapes and exhilarating adventures. You can see more of his work from the Alaska trip by visiting prAna’s website.